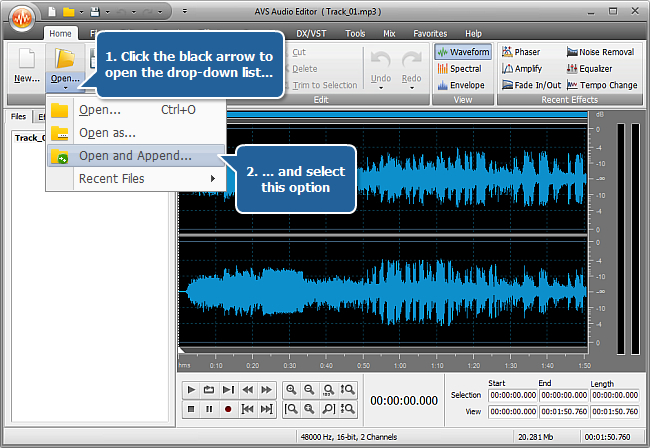 If you'd like to merge a bunch of audio tracks into one file, AVS Audio Editor is always ready to help, even if your input files are of different formats. Follow these easy steps to get one output track of the required format. To open the first track out of the series of files that you intend to merge click the Open button on the Home tab of the Ribbon Command Bar. 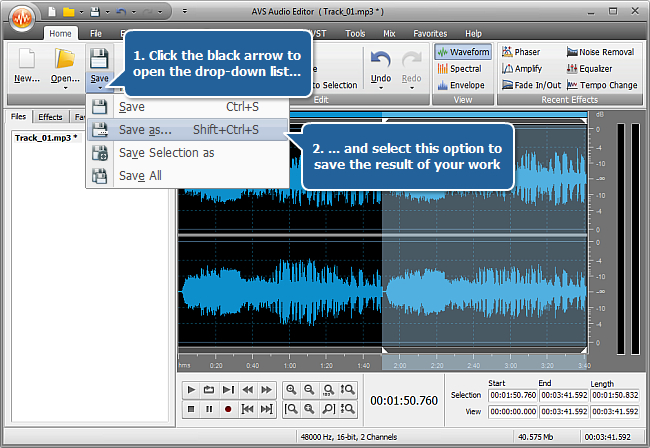 To add the second file to the first track click the black arrow under the Open button on the Home tab and select the Open and Append option in the emerged drop-down menu. In the opened Windows Explorer window browse for the required file. It will be added to the end of the first track. The name of the input file remains unchanged, but the asterisk symbol emerges above it. 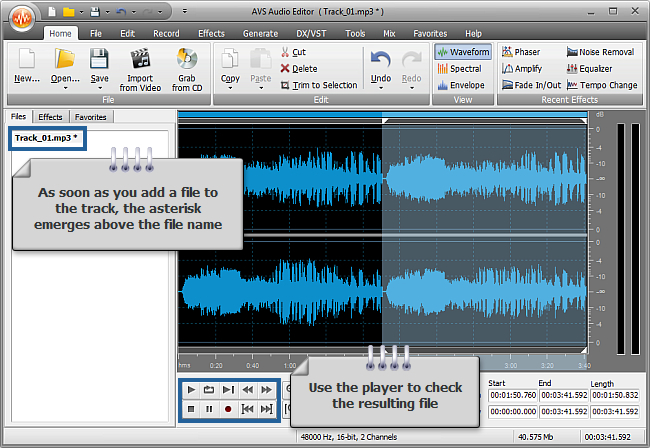 In the same way add other tracks that you need to have in one audio file. 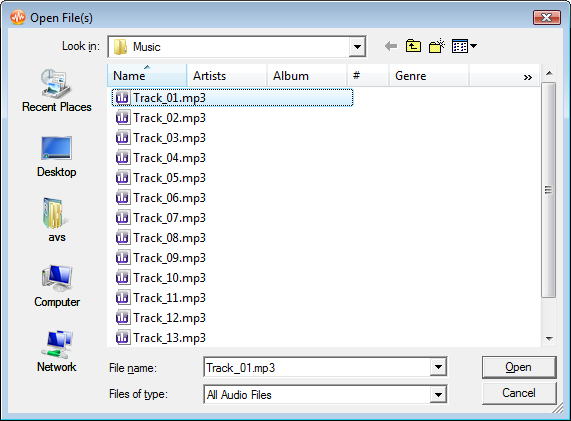 To check if the audio file contains all the tracks you need and there are no unnecessary silence moments use the Audio Player at the Bottom Toolbar. Note: To delete any moments of silence in the resulting track use the Delete Silence button placed at the Effects tab. For more detailed information on this option refer to the corresponding section of the Online Help. 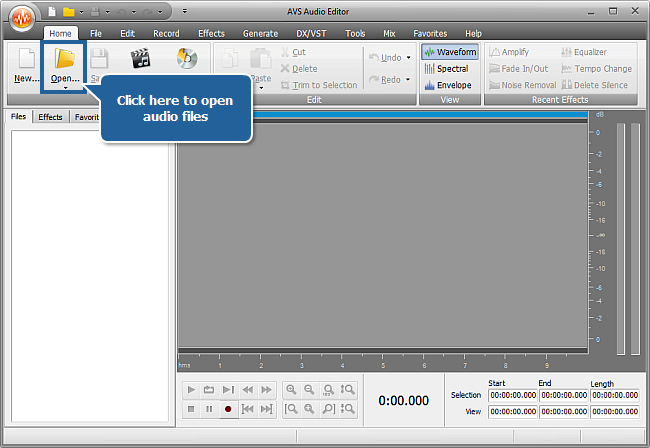 Now when you have one file, which contains all the tracks you needed, you can proceed editing it taking advantage of various effects that AVS Audio Editor offers you.